JAKARTA (AFP) – Greenpeace on Tuesday accused foreign firms like Walmart, Carrefour and Tesco of contributing to forest destruction and species loss in Indonesia by buying from paper and palm oil giant Sinar Mas. The environmental group said Sinar Mas subsidiary Asia Pulp and Paper (APP) was "relentlessly trashing rainforests", spewing carbon into the atmosphere and driving species to extinction in the Southeast Asian archipelago. "Sinar Mas's 'sustainability commitments' are not worth the paper they are written on and some of the world's best known brands are literally pulping the planet by buying from them," Greenpeace Southeast Asia forest campaigner Bustar Maitar said in a statement. A Greenpeace report titled "How Sinar Mas is Pulping the Planet" accuses major international companies of being complicit in the rampant destruction of Indonesia's rainforests and carbon-rich peatlands by buying from APP. Companies listed as Sinar Mas customers include French supermarket chains Carrefour and Auchan, US retail giant Walmart, British supermarket Tesco, British retail group WH Smith, US electronics giant Hewlett Packard, US fast-food chain KFC, Dutch Office supplies company Corporate Express and Australian global paper supplier PaperlinX. National Geographic was named as among the magazine publishers that used Sinar Mas paper, along with CNN Traveller, Cosmo Girl, ELLE, Esquire and Marie Claire. In addition to timber and paper products, Sinar Mas also allegedly uses unsustainable logging practices to make way for palm oil plantations that are seen as a major threat to Indonesian biodiversity. Greenpeace said buyers of Sinar Mas palm oil included commodity traders Cargill of the United States and Wilmar of Singapore, as well as Japanese cosmetics producer Shiseido and US firms Campbell Soup Company, Burger King, Dunkin Donuts and Pizza Hut. "Greenpeace urges all companies still doing business with APP to stop their business with them. By not doing business with APP, those companies help in stopping destruction of forests and peatlands in Indonesia," Maitar said. He praised Unilever, Kraft and Nestle for dropping palm oil supplies from Sinar Mas affiliates, but said Carrefour still sold Sinar Mas palm oil products in its Indonesia stores. Carrefour, Staples, Office Depot and Woolworths (Australia) had stopped buying or selling paper products connected to APP, while companies including Kimberly Clark, Kraft, Nestle and Unilever were reviewing contracts with APP. One of the APP logging areas studied in the Greenpeace report was the Bukit Tigapuluh Forest Landscape, home to endangered Sumatran tigers and orangutans. Another area, Kerumutan, was covered in peatlands that lock in carbon that causes global warming when it enters the atmosphere as a result of logging and clearing. The destruction of rainforests and peatlands is the main reason Indonesia is considered the world's third-largest emitter of greenhouse gases blamed for global warming. "Some of the (Kerumutan) forest's peat is deeper than three metres (10 feet) and thus illegal to clear under Indonesian law," Greenpeace said in a statement. 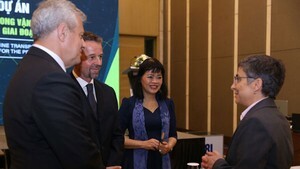 President Susilo Bambang Yudhoyono recently announced a moratorium on new forest concessions in exchange for a billion dollars in aid from Norway, conditional on verifiable cuts to greenhouse emissions. But Greenpeace has joined other concerned groups in questioning the value of such commitments from a country that freely acknowledges massive corruption across its forestry sector leading to rampant illegal logging. "Millions of hectares (acres) of forests including hundreds of thousands of hectares under Sinar Mas control are not part of the deal with Norway. 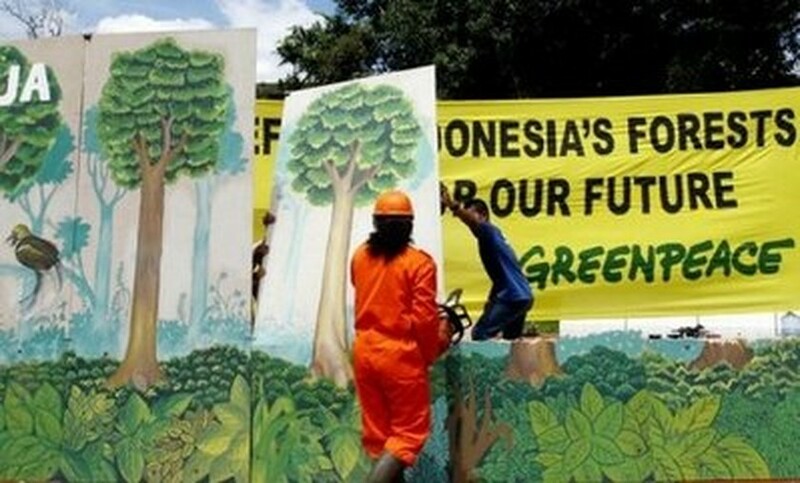 This loophole will undermine all attempts to reduce Indonesia?s emissions," Maitar said. Sinar Mas and APP insist they are committed to sustainability but Greenpeace accuses them of breaking promises to source all pulpwood from timber plantations after 2009.